"Optimism is the enthusiasm that fuels life." If we had the money to have several summer homes, one would definitely be in or near Woodstock, Vermont. This is a lovely little town of about 4,000 residents in the winter and double that in the summer. Since Jim and I are not winter sports enthusiasts we don't think we'd like Vermont winters! But it's a great place to spend time in the summer. 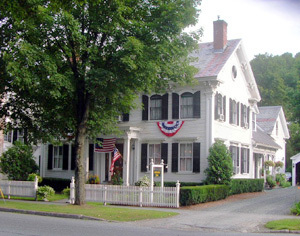 Ask just about anyone who's ever spent a few days here for the Vermont 100-miler in July. Including three VT 100s, this is my fourth time to spend a few days in the Woodstock area. 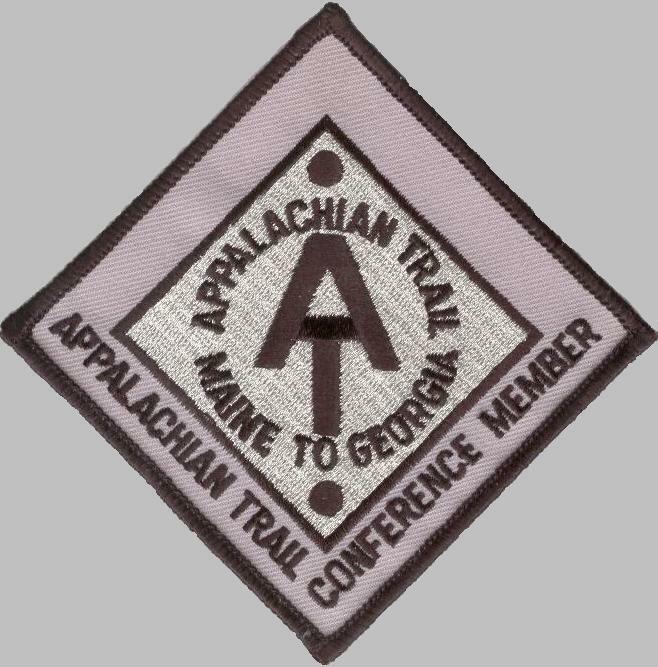 Too bad I'll be on the Appalachian Trail most of the time! Today was "appointment day." 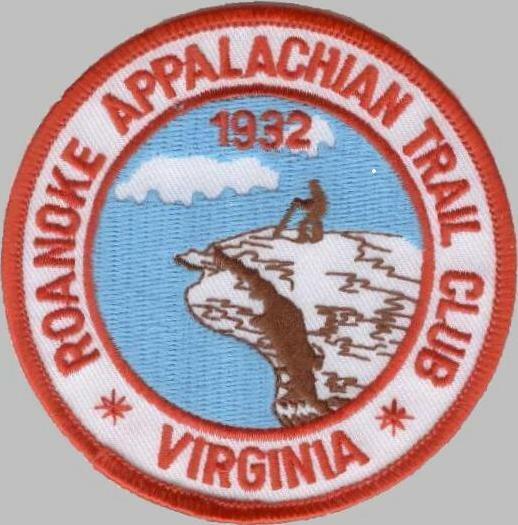 Using my cell phone from the top of various mountains last week, I was able to coordinate three important appointments on the same day in Woodstock: a much-needed massage, a haircut/permanent for my hair-gone-wild, and a chiropractic adjustment. It was nice to sleep later this morning and help Jim "break camp" at Gifford Woods. Woodstock was on the way to our new campground at Quechee Gorge (the same one we used in July for VT 100, Pine Valley CG), so we parked the camper in Woodstock in a large lot for visitors and walked three blocks to the center of town, the idyllic village green. While I was getting a terrific massage from Joe DiNatali, who came highly recommended from my old Atlanta running friends, Hank Glass and Tracy Rose, Jim found the town library and used one of the computers there to access the internet (thereby saving our daytime cell phone minutes). Jim was so impressed with the building that he took me to see it later. Originally built in 1883 and extensively remodeled five years ago, this is one of the most beautiful libraries we've ever seen with its gorgeous woodwork and second-floor balcony. 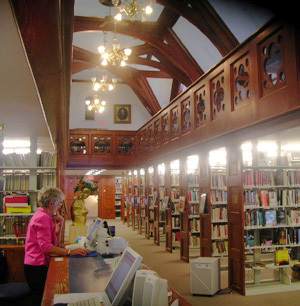 If you're ever in Woodstock, take time to admire the interior of this library. 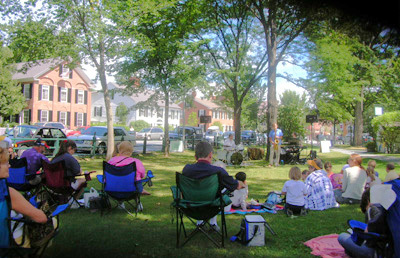 We noticed a sign on the village green about a free brown-bag concert at noon. I asked Joe about it. He encouraged us to go see the popular event that features a different musical group each week, and told us about a good deli a block away. We had sandwiches made and found a shady bench next to a chatty local fella who was able to tell us about the musicians in the Michael Zoldoz Trio. Zoldoz is the local band director and played the saxophone (well, I might add). It was very enjoyable to listen to the jazz as we ate our lunch. After we set up camp in Pine Valley, I returned to Woodstock for my hair appointment (curly again, and shorter) and chiropractic adjustment with Hank. If you recall, he's the running friend who found me limping down the road at Vermont on Day 78 (I think) when I was in pain from a badly misaligned pelvis and pinched sciatic nerve. Two chiropractors confirmed I had a 2" leg length discrepancy at the time, which is very significant if you're trying to walk or run anywhere!. Hank was lending his expertise during the race to assist runners and adjusted me after I dropped out. When we returned to the AT in Pennsylvania, I had two more adjustments from a chiropractor in East Stroudsville that took care of the problem (that, plus a lumbar support for a couple weeks, stretching, and a lot of ice). I haven't had any leg pain for about three weeks now. But now my left neck was clearly out of alignment and I wanted to see how my lower spine and pelvis were doing. Hank prepped my muscles with heat and an advanced type of electrical stimulation that made the adjustments easier. Boy, does my neck feel better after that and the massage! I should be able to sleep much better now. And that 2" leg length discrepancy I had a month ago? Gone! Well, I still have a bit of a discrepancy, but I always have. That's one reason I wear custom orthotics. Hank and I talked quite a bit about folks we know from Atlanta, how much he loves being back in Vermont, and the AT; he's run and/or hiked most of it in VT and all of it in NH and ME. Every bit of information like this that I can get is helpful. I'd also like to publicly thank Diana and Regis Shivers for the wealth of information they've provided about road access and camping in Maine from Regis' 87-day AT run in 2003. They are about the only folks I know of who have done the Trail in just about the same manner as Jim and me (with Diana doing all the crewing, and staying in a vehicle or camper) - only Regis was much faster than I am! While I was gone Jim was busy installing a new door lock on the camper, cleaning vents and carpeting, jury-rigging a new vent cover for the one we mysteriously lost last week over the bathroom shower, unpacking a huge box of Hammer Nutrition products for the remainder of the trek, making a new batch of my favorite pumpkin-sweet potato soup (nope, not sick of it yet! ), and grilling steaks (a rare treat) for supper. Jim gets tomorrow off, except for taking me to the trailhead and picking me up in the afternoon . . . One day recently he asked me plaintively, "When do I get a day off?" A crewperson's job is never done. I couldn't do this without Jim. I owe him big-time for all his efforts to assist me in getting to Mt. Katahdin!